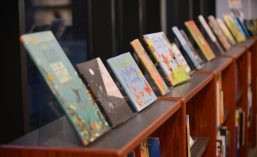 The Butler Children’s Literature Center houses a collection of storytelling resources named for Ellin Greene, a nationally and internationally recognized storyteller and advocate for children’s literacy. Ellin Greene was the Storytelling Specialist and Assistant Coordinator of Children’s Services at the New York Public Library, and an associate professor at the University of Chicago Graduate Library School. She also authored and co-authored four editions of Storytelling: Art and Technique. Our collection began as a result of a donation of picture book tales, anthologies of fairy tales and folklore, reference works, and literature on storytelling from Dr. Greene. Recently, the collection has grown from further donations by Jane Botham, a former president of ALSC and the 2009 recipient of the ALSC Distinguished Service Award, and Zena Sutherland, a former professor at the University of Chicago and editor of the Bulletin of the Center for Children’s Books. Students, faculty, and researchers with an interest in fairy tales, folklore, and storytelling are welcome to visit the Butler Children’s Literature Center to explore the collection.